This week we celebrated my son Carson’s fifth Birthday! 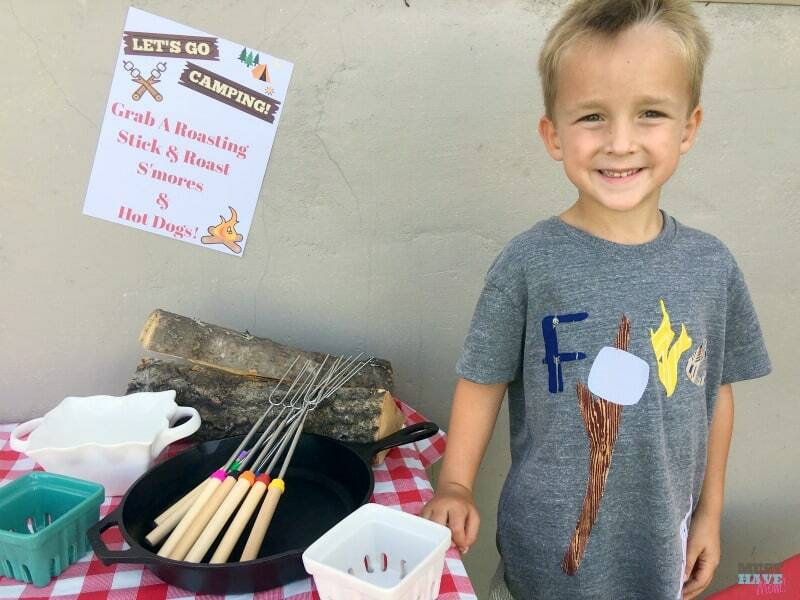 I always let my kids pick a theme for their Birthday party and it was no surprise that Carson picked a camping party! We have been camping all summer long and all of our children just love it. 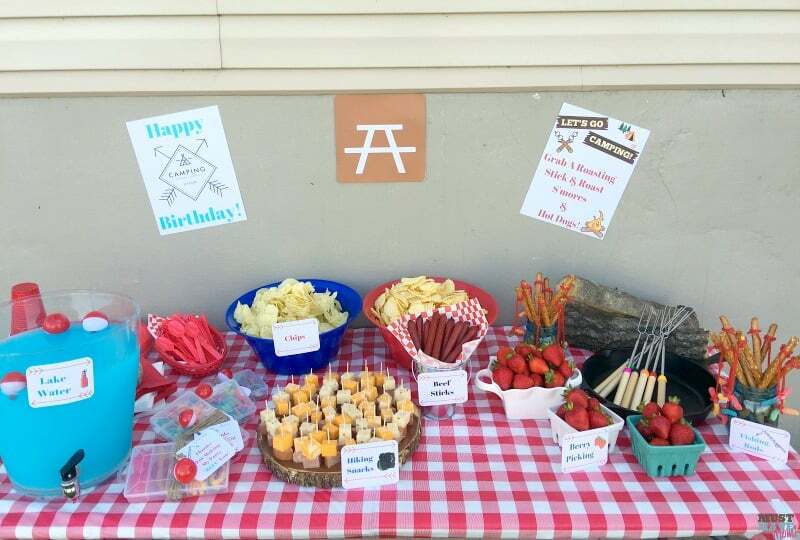 A camping themed Birthday party was right up my alley and it turned out to be a very easy theme to pull off! 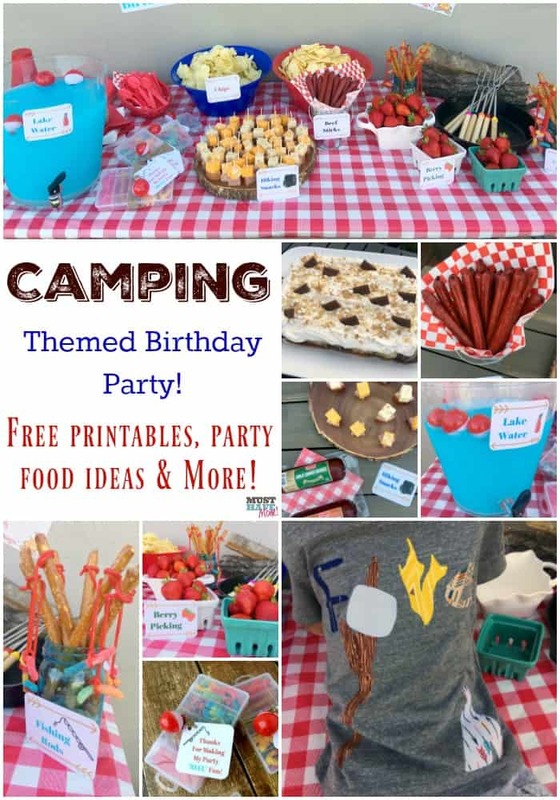 I’ll share all of my camping party food ideas along with free camping party printables to make your party easy and adorable! 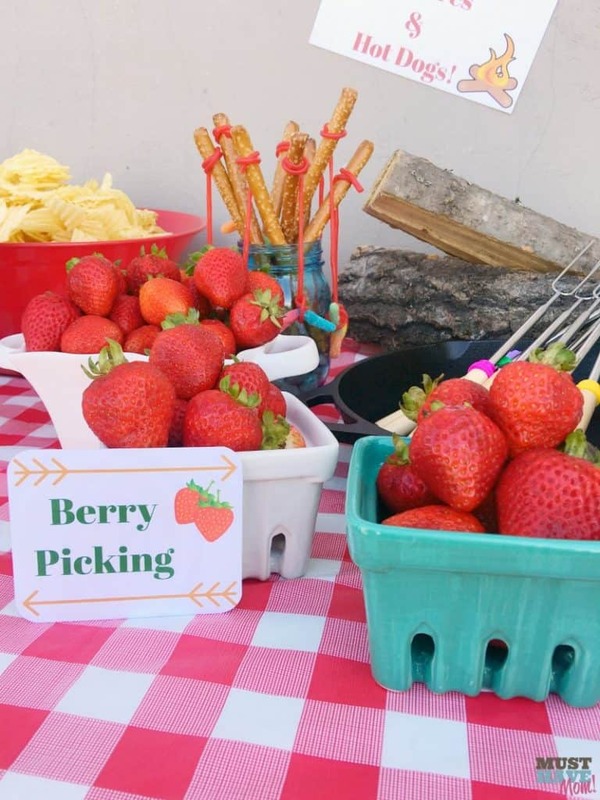 We had so much fun with the camping themed Birthday party food ideas and you’ll find that all of them are really easy to make, with very little prep ahead of time. I love that Carson has a summer birthday because that means we get to party outside! I set up a table with a picnic tablecloth and stuck to red/blue/white and natural camping-looking dishes and serving trays. My favorite was the tree bark serving tray! I added some firewood and a cast iron pan for decor, both items I had on hand. We wanted to stick with our camping themed birthday when it came to the food and we had fun coming up with different ideas for camping party food! 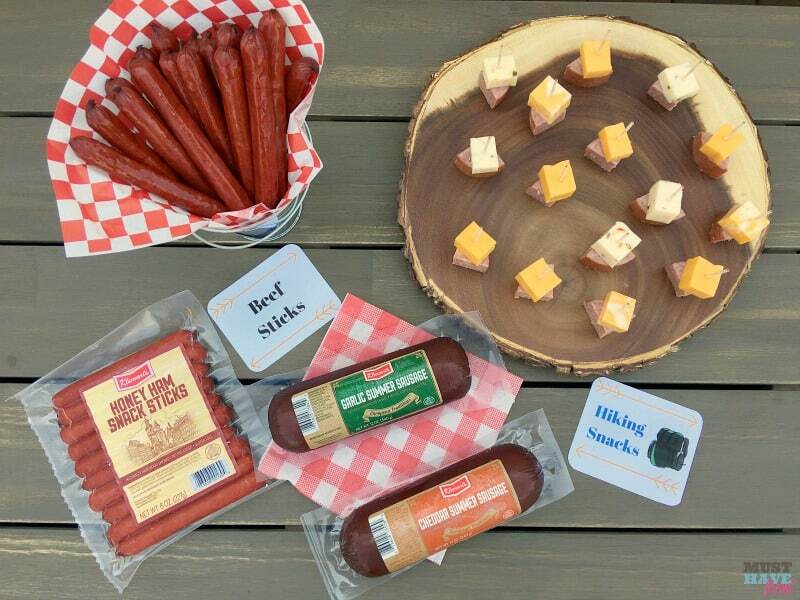 We naturally had some experience to pull from after camping all summer and there were two things Carson wanted to make sure we included in his party food, beef sticks and summer sausage! He just loves them and we always take them camping because they are a quick, easy snack which also makes them perfect party food. I arranged the beef sticks in a variety of flavors nestled inside a metal bucket with a picnic paper liner. 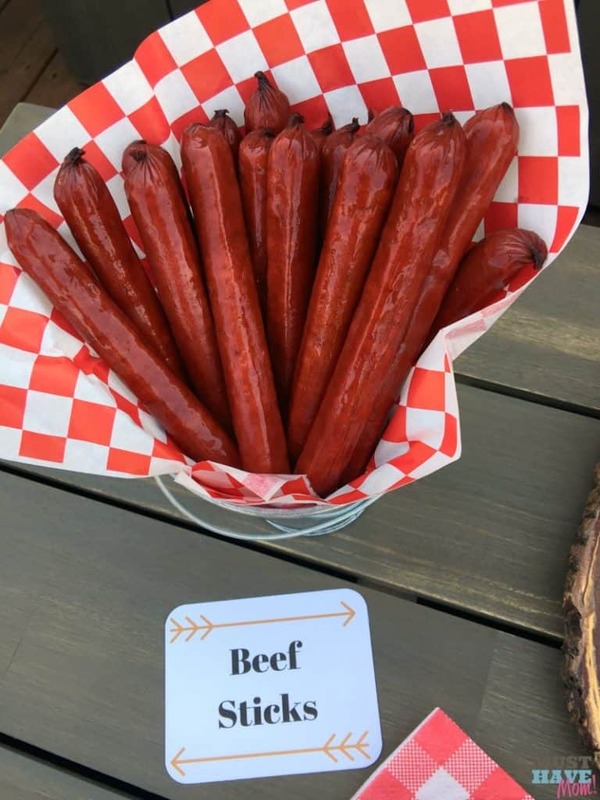 I laid out the free printable beef sticks food sign to go with it! 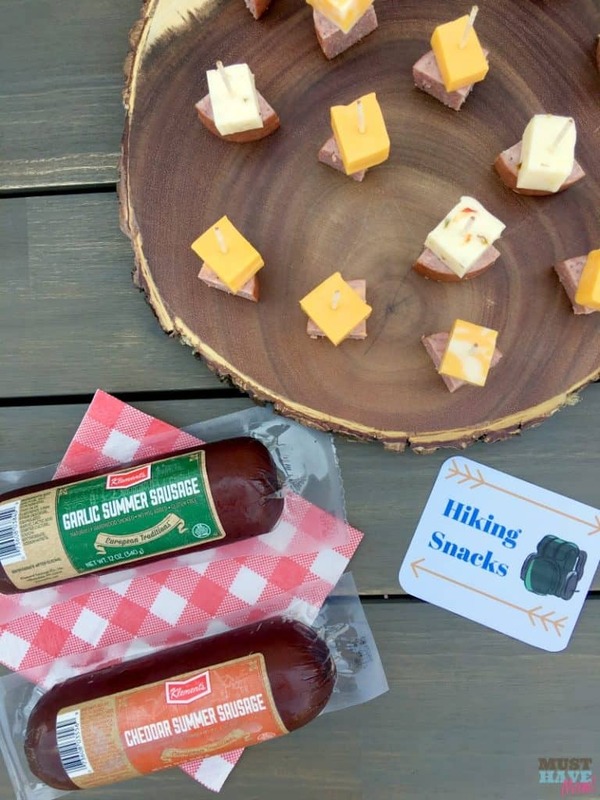 For our “hiking snacks” I cubed cheddar summer sausage and garlic summer sausage along with various varieties of cheese. I speared them with a toothpick which made them super easy to grab and pop in your mouth! 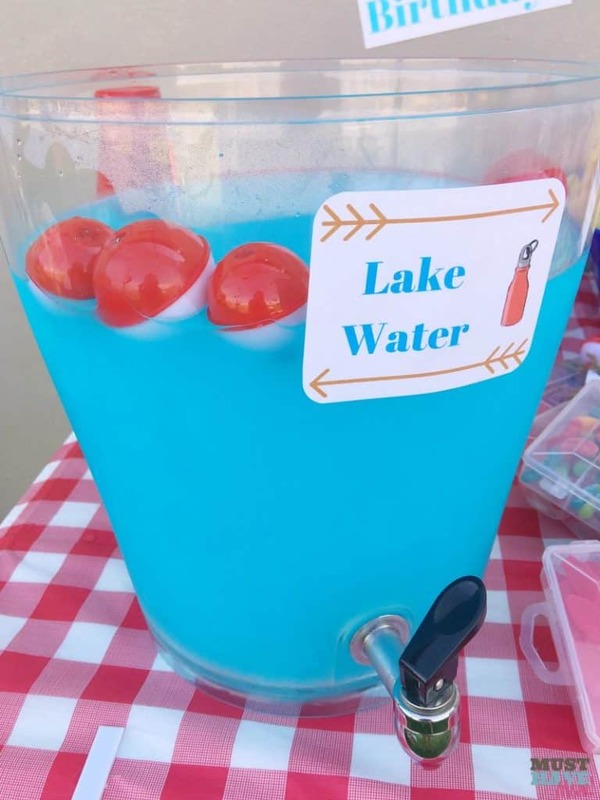 For our beverage we made “lake water” from blue Kool-Aid and added some bobbers in it for a fun effect. 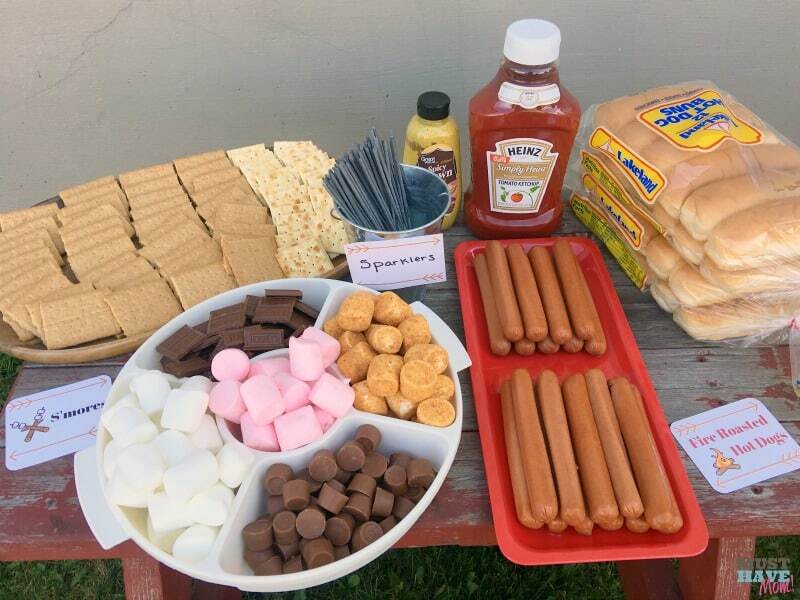 We set up a roasting table and had a campfire going so people could roast s’mores and hot dogs over the fire. We had to create a realistic camping experience for everyone and they loved it! 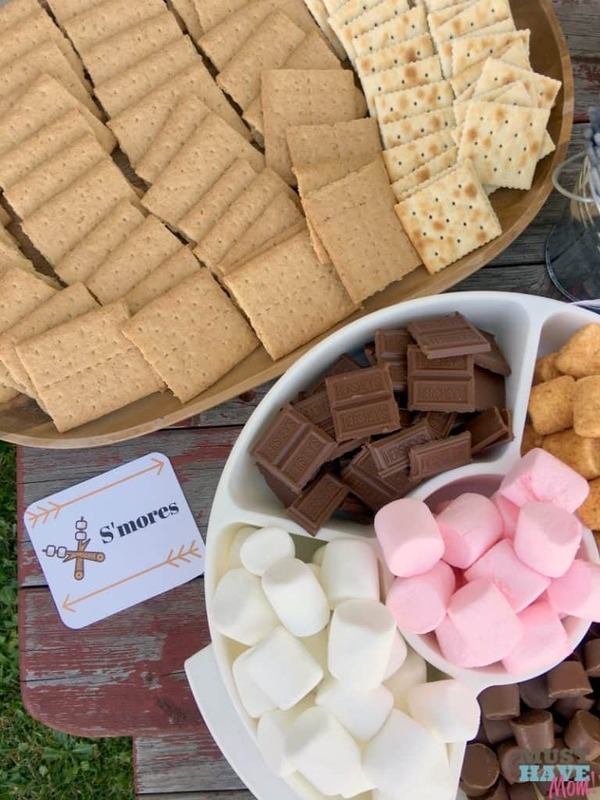 For our s’mores tray I made sure to include all of our s’more favorites including regular marshmallows, strawberry marshmallows, toasted coconut marshmallows (my personal favorite! ), chocolate bars and rolos. It was so much fun sitting around the fire roasting hot dogs and s’mores! Don’t forget to have plenty of roasting sticks on hand!! We like these kind best because they store compactly and don’t take up much cupboard space. 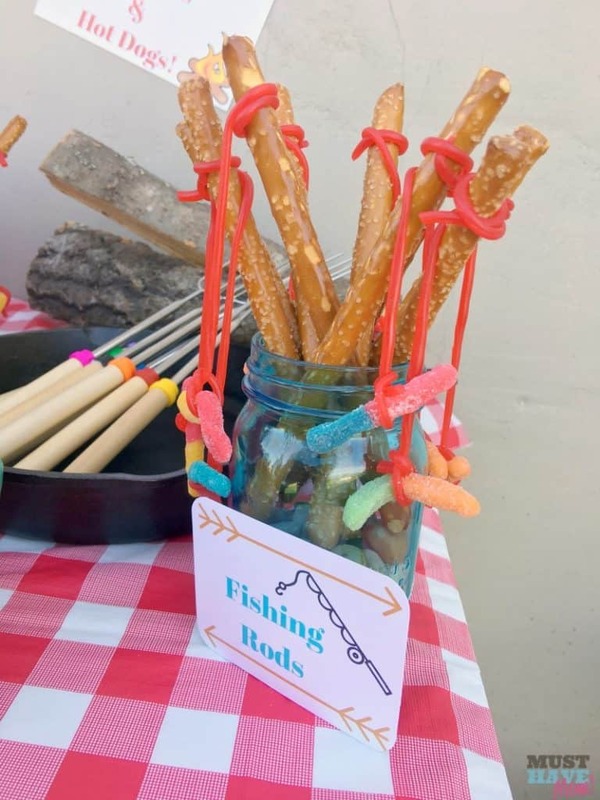 We also had “fishing rods” made with pretzels, licorice and gummy worms. Get the instructions on how I made them here. I offered up fresh summer strawberries in berry picking containers! 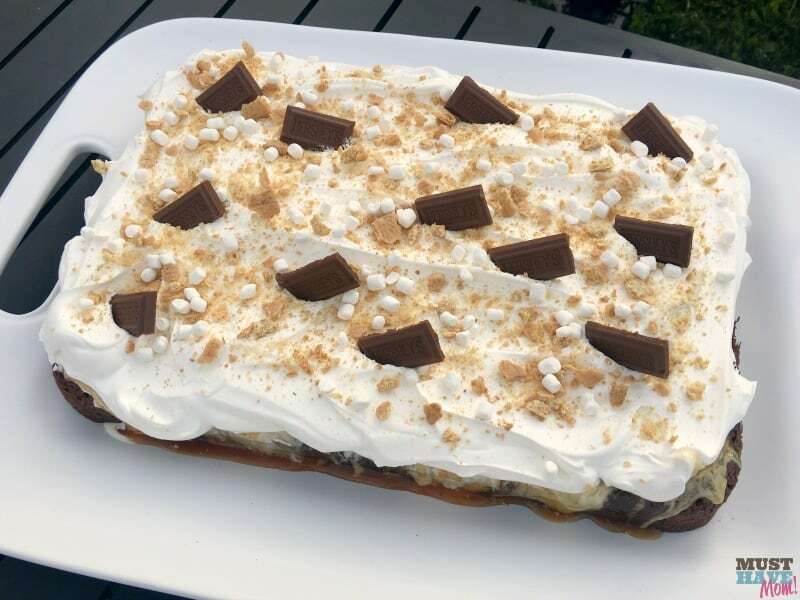 And the birthday boy chose a S’mores cake for dessert! This cake was amazing. I was a little nervous because I made up the recipe on the fly and wasn’t sure how it would turn out. Everyone was raving about it! It was so delicious! Even though we had cake people still made s’mores too! You can never have too many s’mores! I also had a metal bucket filled with sparklers which were a huge hit with the kids and they all disappeared in no time! 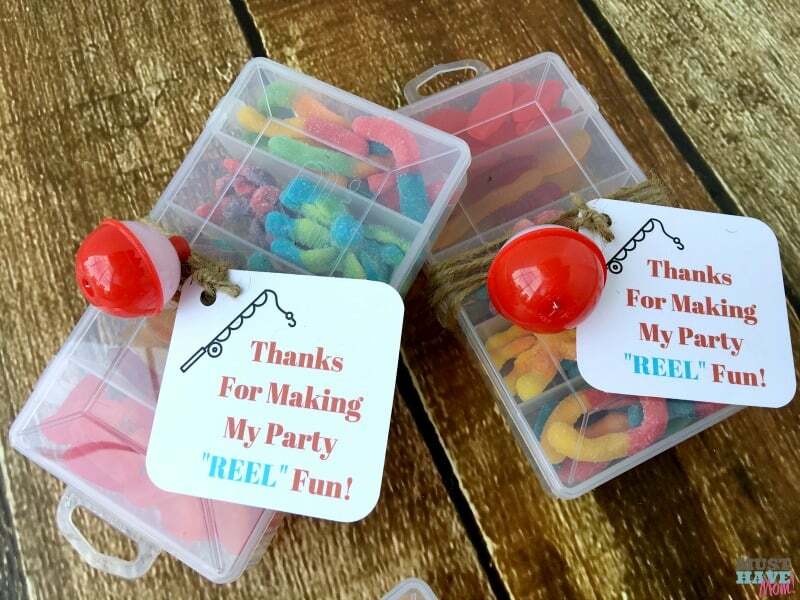 I made these adorable gummy tackle boxes with the free printable favor tag that says “Thanks for making my party “REEL” fun!”. They turned out so cute! I used these small tackle boxes for them. I decorated around the party area with Birthday signs and camping signs. These are also included in my free printable camping themed party packet! Be sure to print them on cardstock paper. 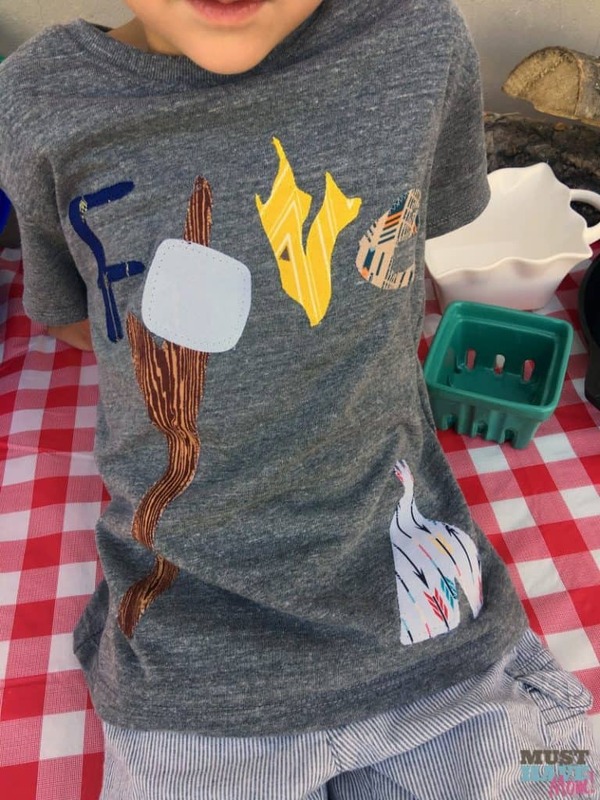 I ordered Carson this absolutely adorable camping themed party shirt that read “five” in fabric letters, complete with a stick roasting a marshmallow for the “i”. I can’t get over how adorable this shirt turned out! You can find them for any age in this etsy shop. She is a mom too and makes custom shirts for all sorts of party themes! The shirts are so soft I want one! They are made from an organic blend and she does an amazing job. She also got me the shirt on the fly after I had to move our party date up! Super impressed with her! 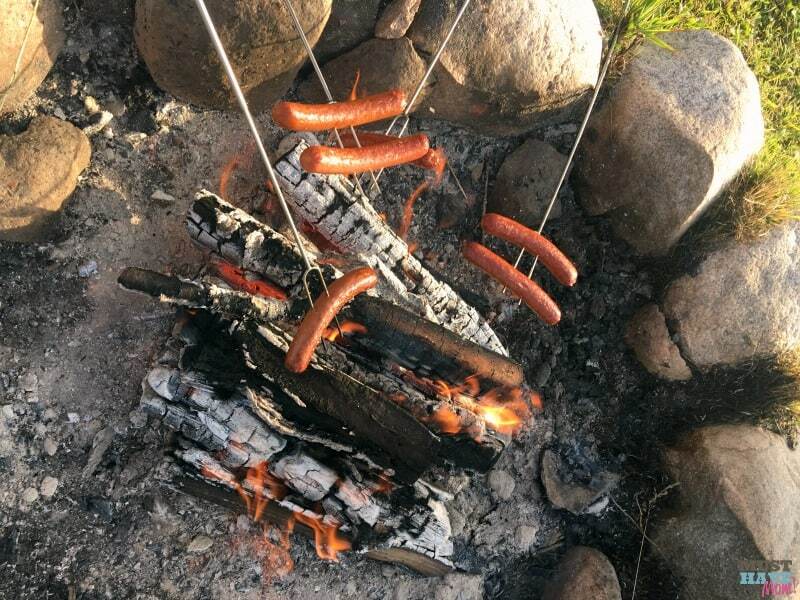 Make your roasting sticks part of your party decor by placing them in the cast iron pan next to firewood! 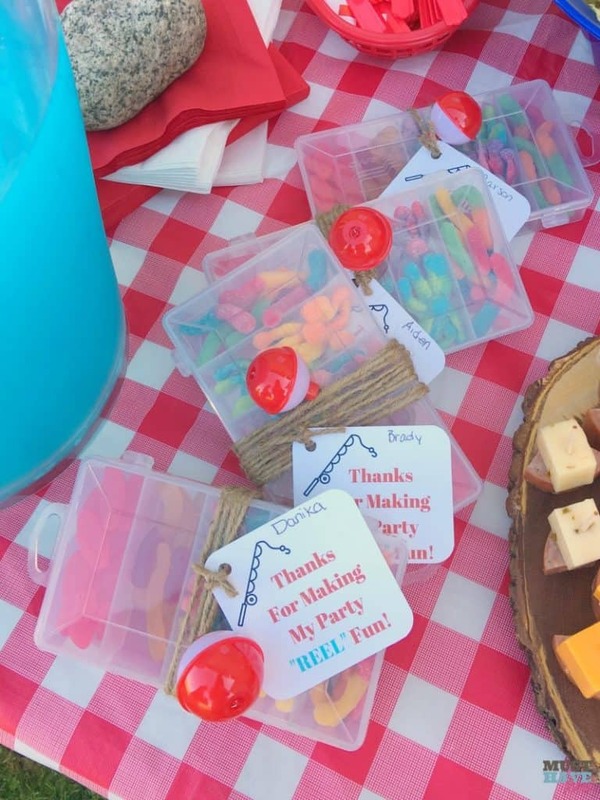 We had so much fun putting this camping themed birthday together and all of our guests loved the party. 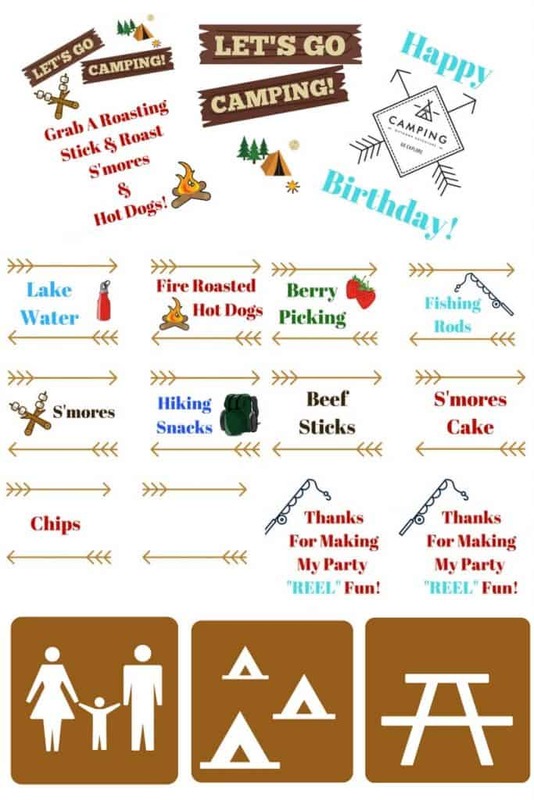 You can print off all of the adorable camping themed birthday party printables by clicking here! 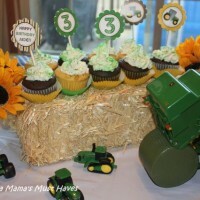 This includes the food signs, favor tags, party signs and more! 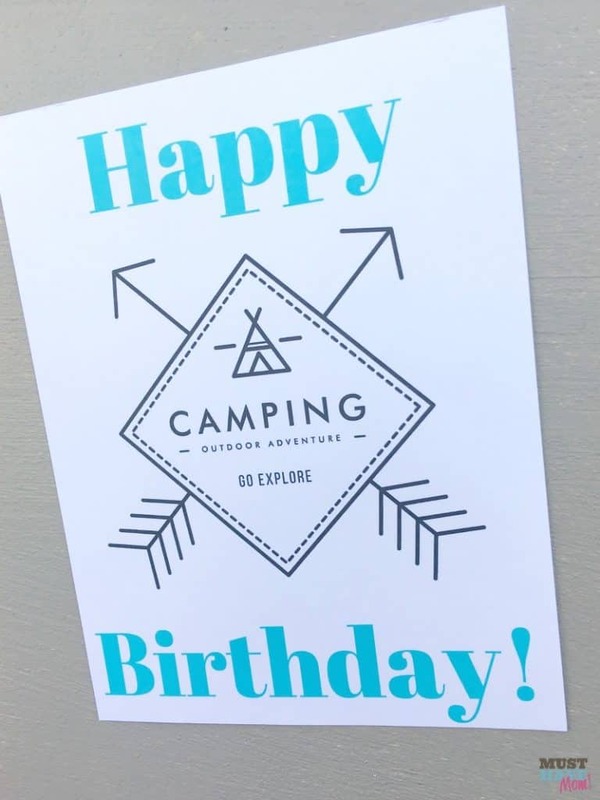 I hope you enjoyed all of my camping themed birthday ideas! I’d love to hear how your party goes! Be sure to pin these images for easy finding later! « Sunday Sweeps Giveaway Linky! 8/28/16 Edition! This looks like a lot of fun! 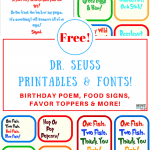 Great printables, too! Oh! Great ideas! We’re having a ‘camping theme’ for my son’s first bday. Thanks for sharing this and for the free downloads! I’m so glad you found this helpful. Happy birthday to your little one. Thank you so much for the printables! That saved a lot of time! 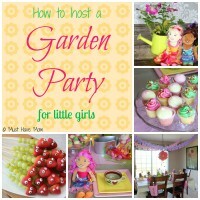 Thank you so much for sharing your printables! 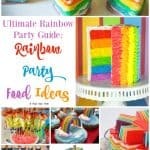 Your party looks awesome! By any chance, do you know what font you used for the labels? Thank you! You’re welcome! The font on the labels is Abril Fatface. Good luck with your party!